Summertime is grilling time but we rarely think about grilling fruit. It really is a wonderful way to take advantage of all the amazing fruit in season as well as a healthy treat. 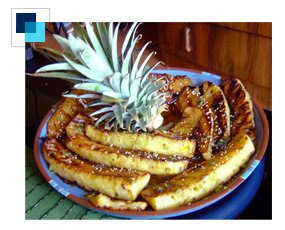 One of my favorite fruits to grill is pineapple. It goes with almost anything and also makes a nice spread! Now, I don't personally have a barbecue since, well, I don't have a yard, so I prepare this in my handy stove top grill pan. However you do this, it's easy and delicious. Cut ends off the pineapple and reserve stems. Stand pineapple upright and cut off the skin in strips. Quarter the pineapple lengthwise and cut out the core. Cut each quarter into 3 spears. Zest the lime and reserve. Cut the zested lime in half and squeeze the juice over the spears. Brush the grill pan or outdoor grill with vegetable oil or spray lightly with cooking spray. Grill pineapple until evenly marked all over, 5 minutes. Garnish spears with lime zest, drizzled honey and sesame seeds. Arrange with stems on platter. This is one of my favorites when I do a big cookout. I never would have thought of the toasted sesame seeds though~! I wish we did not live clear across the country so we could invite each other over for a sample ;) I am an amazing cook too! This blog is dedicated to the two most important people in my life - my mom, Ernee Jean O'Brien, and my partner Joey Concepcion. They both have showered me with unconditional support and love and have always encouraged me to be myself. I will always miss my mom and I don't know what I would do without Joey. Get the Cooking with Sean & Joey widget and many other great free widgets at Widgetbox!